Disposable Laparoscopic Pencil (Hand-Controlled)(SW12200 Laparoscopy Series) - Shining World Health Care Co., Ltd. Experience SHINMED's laparoscopic hook with multinational Approved ergonomically designed ESU pencil─Ultimate safe, Ultimate comfort. SHINMED's laparoscopic pencil features five types of tip shape for widest application, non-stick coating also available. Electrode fixed directly to streamlined designed ESU pencil body, preventing any unwanted turn or fall during operation while giving surgeons the firmest and confortable grip. 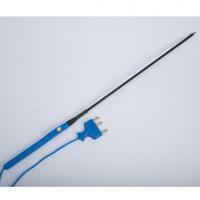 Electrode: 340mm/430mm Five shape Available(Optional Non-Stick Surface Treatment).